Datolite is a colourless mineral consisting of a hydrated silicate of calcium and boron in monoclinic crystalline form, occurring in cavities in igneous rocks. Its formula: CaBSiO 4(OH). It was first observed by Jens Esmark in 1806, and named by him from δατεῖσθαι, “to divide,” and λίθος, “stone,” in allusion to the granular structure of the massive mineral. 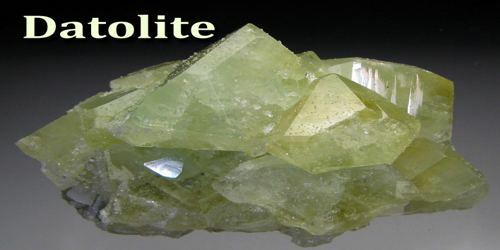 Datolite is a calcium borosilicate that occurs in fine grained nodules found in old copper mine dumps. Datolite is coloured by iron oxide, copper and silver, giving a range of soft hues of pink, peach, red, green, and violet on white opaque porcelain like background, sometimes with lacy inclusions of copper of silver. Datolite crystallizes in the monoclinic system forming prismatic crystals and nodular masses. The luster is vitreous and may be brown, yellow, and light green or colorless. The Mohs hardness is 5.5 and the specific gravity is 2.8 – 3.0. The structure of datolite consists of sheets of four- and eight-membered rings of corner-sharing, alternating (HBO4) and (SiO4) tetrahedra, classifying it as a phyllo-borosilicate. The net formula of the anion is (HBSiO5)n, with (HBSiO5) as the repeating unit (Foit et al., 1973). Instead of (HBSiO5), the formula may also be written as (BSiO4OH) or (BSiO4(OH)), indicating that the proton is bonded to one of the oxygen atoms. The mineral does not contain any isolated hydroxide ions, though. 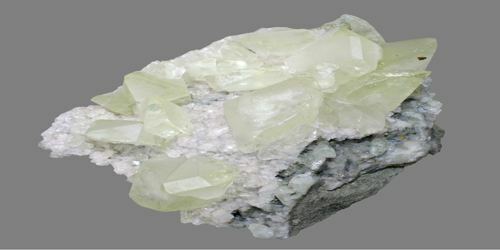 Associated minerals include prehnite, danburite, babingtonite, epidote, native copper, calcite, quartz and zeolites. It is common in the copper deposits of the Lake Superior region of Michigan. It occurs as a secondary mineral in mafic igneous rocks often filling vesicles along with zeolites in basalt. Unlike most localities throughout the world, the occurrence of datolite in the Lake Superior region is usually fine grained in texture and possesses colored banding. In distinct short but stubby crystals with many crystal faces and angles. Often in interlocking groups of crystals, platy, drusy, and as crystal plates linings vugs and geodes. Also forms in earthy and botryoidal nodules. 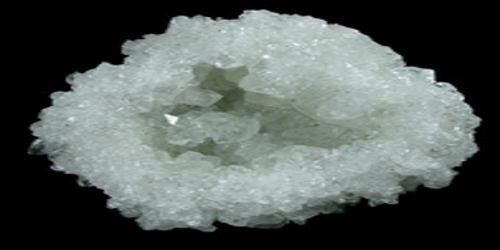 May also form as an epimorph after Anhydrite and Glauberite of hollow crystal casts. Datolite has a strong connection to the Akashic Record and, placed on the third eye chakra, provides a download of karmic and historic information that may take time to process and integrate but ultimately shows the overall soul plan for all our lives. It helps with problem-solving and also helps increase our memory, especially our ability to remember things that are important. This crystal allows our heart to grow closer to our loved ones, and this crystal will also pull us closer physically to those you love. Green Datolite will connect our mind and body so that the past can be healed. It facilitates increasing our memory and ends any flashbacks we might have from trauma while healing them. It enables us to replace old worn out memories with new joyful ones. 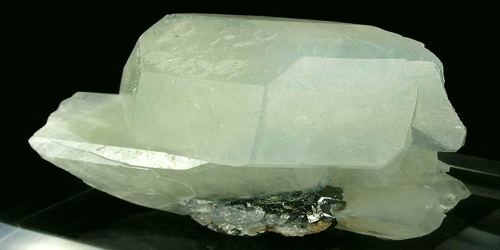 White datolite balances our ability to live beyond time while still living in the earth plane’s time strictures, eases discomfort from time speeding up in Earth changes. This stone will help us to better use time without being a slave to time. 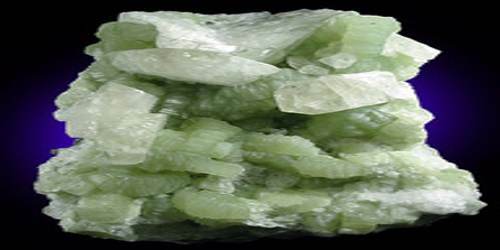 Datolite also activates personal soul and far memory and opens the soul star chakra. This stone assists in recognising the transience of all things, ensuring that we know that “this too will pass” and, therefore, it is a useful stone during violent upheaval or tumultuous change as it provides enormous comfort and a place of inner peace to hold on to, dissolving fear and releasing grief.